It’s that time of year, when flocks of snowbirds begin heading to warmer climates, and the Lone Star State is a prime destination. Located 80 miles west of San Antonio in the popular Texas Hill Country, Parkview Riverside RV Park in Concan is a favorite destination campground that will keep you busy no matter what time of year. 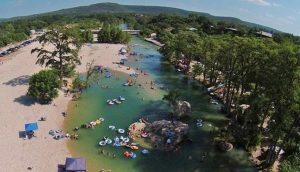 Featuring 95 sites and nestled on the Frio River, Parkview Riverside RV Park has been drawing visitors from near and far for years. This pet-friendly and family-friendly RV park offers full hook ups and other amenities, including 20/30/50 amp service, water, sewer, cable TV, Wi-Fi, pull-throughs, picnic tables and fire rings, and plenty of room for slide outs. There’s also a coin-op laundry, convenience store, dump station, outdoor pavilion, and an air conditioned bath house. During the hot summer months, visitors relax and cool off in the spring-fed Frio River, which also offers year-round fishing. Nearby, Garner State Park offers plenty of options for swimming and hiking, or simply to enjoy a relaxing weekend. With 2.9 miles of Frio River winding through 1,774 acres of scenic Hill Country terrain, the park offers lots to see and do! For golf enthusiasts, Parkview Riverside RV Park offers a fabulous RV-golf package that’s hard to beat. 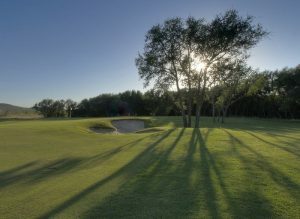 They have partnered with The Golf Club of Texas – Concan, or simply The Club at Concan, which also is nestled in the Frio River Texas Hill Country region. The Club at Concan is a par 72 championship course and features 18 holes, stretching to 7,333 yards from the tips. The 10-year-old course was designed by Randolph P. Russell and Roy Bechtol. From the gorgeous backdrop of hills and valleys to the stunning rolling terrain, visitors love the picturesque scenery that’s abundant throughout The Club at Concan. A fun golf-related side trip is a short drive to nearby Utopia. This small town gained lots of publicity several years ago after the movie ‘Seven Days in Utopia’ starring Robert Duvall was filmed in Utopia. The Links of Utopia was the setting for the book and movie about Golf’s Sacred Journey, which is a blend of fact and fiction. There really is a Utopia, Texas, and there is a 9-hole golf course. However, Hollywood takes editorial license on other facts in the movie. It’s still an interesting and peaceful place to visit. If you’re a golfer, you should experience this course, if for nothing more than the beautiful scenery in the Sabinal Canyon. Concan is also a popular birdwatching destination. Visitors come from around the world throughout the spring and summer to spot and photograph unique birds that make a stop in Texas Hill Country. For dining, locals recommend a visit to the House Pasture Cattle Company Restaurant, which is legendary for its delicious home-style cooking. Visitors rave about the country fried steak and country fried chicken. The area is usually quite tame and peaceful most of the year. However, in mid-March, they kick it up a notch when the Rio Frio Fest takes place. This festive annual event is a huge music festival that christens springtime in the Texas Hill Country, and showcases a number of Texas musicians, great food, and the Frio River. During warmer months the Frio Bat Flight Tours are very popular and exciting. 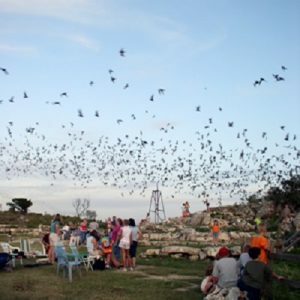 Frio Cave is home to an estimated 10-12 million Mexican free-tailed bats. On scheduled evenings, from March through September, guests meet with a guide who explains the history of Frio Cave and the bats that call it home. Then, standing near the cave opening, visitors watch and hear the bats fly out over their heads. On most evenings various birds of prey fly in to feast on the bats. All this takes place as the Texas Hill sun is setting. For more information on Texas Hill Country, visit TexasHillCountry.com. You can also find more details about Parkview Riverside RV Park on Campground Reviews. Rick Stedman is an avid golfer, RVer, and writer who lives in Olympia, Washington. Rick writes a weekly golf blog, The 19th Hole for RV Life. You can reach him at rstedman@gmail.com.